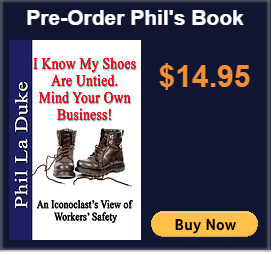 A self-described provocateur and iconoclast, Phil La Duke has poked and prodded the word of safety asking those awkward questions about some of the Safety professions most sacred truisms and indelicately pointing out flaws in long established and accepted safety practices. Phil La Duke is an itinerant pot stirrer, internationally renowned executive consultant, safety expert, speaker, blogger, trainer, and business author. He frequently guest lectures at universities including presentations at Tulane, Loyola, the University of Michigan, and Johns Hopkins and is on the Wayne State Biomedical Safety Board. With over 250 published works in print, La Duke, has contributed content to numerous notable magazines and is published on all inhabited continents. Mr. La Duke’s take-no-prisoners style garnered him positions on Industrial Safety and Hygiene News (ISHN) magazine’s Power 101 (a list of the world’s most influential people working in worker safety) and its list of Up and Comers in Safety Thought Leadership. Phil LaDuke truly shatters the decades-old mindsets of safety professionals that have mired the profession in ideological adherence to accident safety practices, while stifling the introduction of innovative approaches. Provocative as Phil is, he brings a refreshing counterbalance to the safety conversation and makes us think. Indeed, Phil is the “Dirty Jobs Mike Rowe” of the safety profession. “Phil La Duke has devoted his career to industrial safety. He knows the importance of doing an unglamorous job well and what goes terribly wrong when people don’t. He is angry about all the right things.